We're always excited when real stories get promoted in the creative industry in Denver, so when we came across The Denver Egotist's post highlighting work from Parallel Path and Roos Brothers we were inspired to watch and discuss. Three short films were created to promote Rocky Mountain Health Plans using real stories of people's lives on the Western Slope. They're beautifully and artistically done. We've started working on a series of stories for The Colorado Trust that mirror written stories published in their Advance newsletter. The stories cover all areas of topics around health equity in Colorado, and we were so impressed by the amazing reporting and information that we saw an opportunity to produce videos that would spread the stories even further. Check out the first video in the series below that highlights three Colorado residents with very diverse experiences, and their stories about transportation and its disproportionate effects on health. We were asked to produce a visual story this month to compliment and build upon a written story published by one of our foundation clients. The story featured several characters, and we had freedom to speak with the people featured in the written story, or explore new areas and highlight new people. It's always a joy when we're able to dive into our own exploration process and seek out people that have very interesting things going on in their own communities, but don't often get the chance to have their voice heard. In this process of searching for people willing to share their story, this time about transportation issues for people in various environments around Colorado, we discovered Bill. He lives up in Gold Hill, a rural mountain town in the hills behind Boulder, up a steep and winding dirt road that you would never know exists. After a quick phone chat with Bill, we thought he would be a great piece of the story and could explain how he survives without a car in such a remote community. Often a phone call or two is all we have before meeting with someone and trying out an on-camera interview. It's often easy to tell if someone is going to be forthcoming on camera or not, and we find that most of the time people are excited to tell their story and have an active listener. Bill had agreed to an interview in his home, a dome structure up a steep hill without running water. He greeted us with tea and coffee, so warm and generous, and showed us a bit around his property. He lives a simple life, is retired because of a disability from an accident he had years ago, rides his bike and spends weeks in the woods behind his house camping and being in nature. He produced some wild foraged mushrooms for us as a lunch offering, which he grilled in butter with asparagus and local bacon - a savory and unexpected treat for us. During the interview we gathered much more than we needed for the story, but we often experience people opening up to us during interviews and understand that a listening ear is not offered much in people's lives. When they get the chance to open up, and receive genuine listening ears, they feel inspired and unfold layers of themselves. We understand that our job is not just to gather the story, but also to treat people with the utmost kindness and respect, acknowledging their humanity. We have a great responsibility with our cameras and editing capabilities, and when people offer a willingness to be vulnerable in front of our cameras, it's our job to take care and listen deeply. The experience with Bill in his nature home and esoteric ramblings was a stark contrast with our next character, Pam from Montebello. We sat down with Pam in a park and learned all about her experience has a walker in her community. Pam is full of fire and energy, and leads a walking group in Montebello. She advocates for black women to get out of their homes and walk their community, to fight preventable diseases and also create a stronger sense of community. We learned about the greatest struggles Montebello has, and how the city has been built around the assumption that everyone owns a car, which not everyone can afford. We were inspired by her vivaciousness as a retired woman in her 60s, advocating for policy changes and galvanizing hundreds of other women in her community to make a change for themselves and where they live. We followed Pam through the streets with our cameras, documenting the dangerous and unfair experiences she has as a pedestrian trying to navigate her own city. It's these varied experiences that we love exploring, just minutes or hours away from our own homes in Denver, and it takes getting out into the community and talking to folks to understand and capture diversity of life. Everyone has something to share, and many people welcome us into their world without hesitation. When we leave ourselves open to the organic story that unfolds, we experience true humanity and can develop a story that expresses vulnerability and depth. We're also highly impacted by the experiences we enter into as filmmakers, and we learn a great deal about people and issues every time we discover a new story. This year we wrapped up a three-year video project with The Colorado Health Foundation, and we've been reflecting on the experiences we had in different communities. We were tasked with capturing a three-year grant process in three different communities - Westwood, Lamar and Arvada - getting to know each one and watching them grow into more abundant, stronger, physically active and healthy neighborhoods. We captured the growth in each place from the very first meeting to the last, following the key community leaders as they gathered around their neighbors and made decisions about what would make their community healthier, including implementing new parks, sidewalks, bike trails, neighborhood gatherings and youth sports programs. The result was one video per community per year highlighting the different themes of the year and stories of communities leaders who had grown throughout the process. We are so lucky to have been the chosen video producers for the project, and we grew with each community along the way, as we were in active conversations with each place and captured their greatest milestones in a long, rewarding process. It takes a different approach to work on such a fluid video project, over a long period of time. It took a lot of relationship maintenance, changes of plans, reassessment of communications goals, and creativity in translating what had happened in each community over the three years. We enjoy having a window into the intense work and dedication of grassroots activism and the strength communities have when they learn to work together. We were continuously inspired as we developed new and interesting ways to capture their progress, and we built relationships with people that we enjoyed getting the chance to interview over the years. These are the kinds of projects we like to go after - ones where we can dive deeply into a community project or process with people that are doing very important work on the ground. If we can develop beautiful videos around such movements and distribute them widely, we believe we can expand people's overall circle of concern and encourage people to act in their own lives, while also creating empathy and understand for those communities and folks they may not interact with every day. Check out the videos for each community below! We wanted to share a media campaign that Cactus and Lyra Health partnered on recently that really impressed us. Presenting mental health in a physically alarming form to portray a strong message about the crippling affects of not addressing our mental health issues. In our video storytelling journeys over the years, we've often been in spaces of discussing mental health issues and highlighting the stories of folks who are willing to be vulnerable about their health-related experiences. The landscape is changing in the realm of mental health and its associated stigma - more media is being released revealing just how prevalent mental health issues are, and more resources are being created for those that want to seek help. It all starts with talking about it openly and welcoming others into the conversation. We're glad to see a widespread media campaign that speaks to the issue in such a striking, serious, yet lighthearted way to reach a wide audience of people and demand attention. What if our mental health problems were taken as seriously and treated as immediately as our worst physical ailments? It's the beginning of a big narrative shift around mental health stigma. 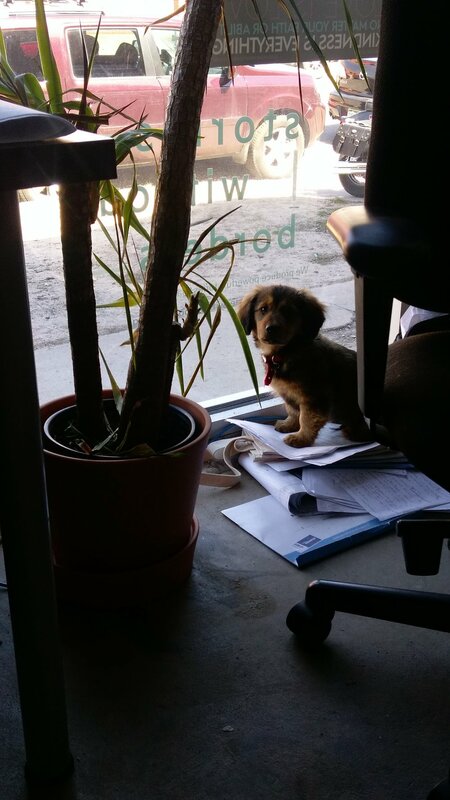 We have a new canine team member! One awesome thing about working in Green Spaces is they allow dogs, because dogs make the community that much better! Chloe Wittry our Producer adopted little Sam from a rescue that brought him up from Tijuana. He is a dachshund mix, and as you can see from the photos, he provides us with quite a lot of entertainment. 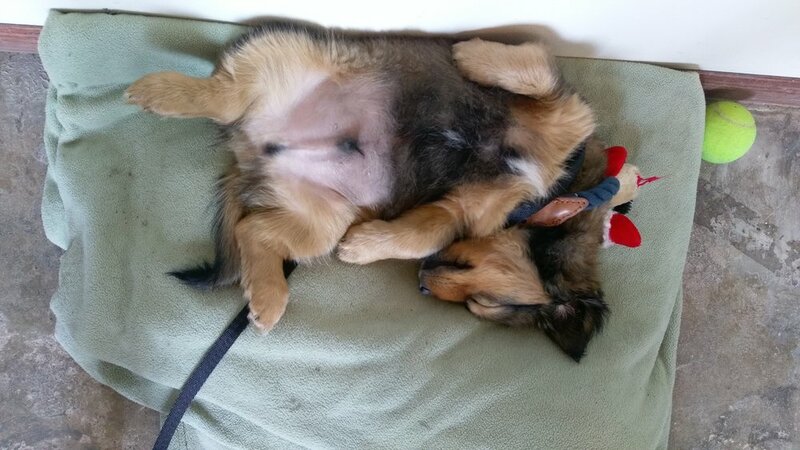 He has a big personality, likes his puppy naps, and keeps the office light-hearted. Enjoy the photos! The Art of Listening: Why Isn't It Taught? We came across this brilliant article written last week on one of our favorite publications, On Being, about a young man who walked 4,000 miles across the U.S. to listen. He carried a sign that read, "Walking to Listen," and that's precisely what he did - spending time with Americans from all walks of life in all different parts of the country. Listening is such an important part of our job as journalists, as filmmakers, because we have a duty to carry someone's story. We open people up through interviews, and it's only through real, curious, careful and attentive listening that those people feel comfortable talking to us. We ensure we're creating safe spaces for the interviewee to be able to open up. We listen in earnest, we listen not knowing the answer, we listen to gain perspective, and most importantly we listen with respect. We want to tell stories that bridge gaps and create a sort of ladder for people to climb the "empathy wall.." It's true that through authentic stories our minds can be changed, our hearts can be opened, we start to listen, we start to connect and the walls come down. To craft these stories we have to become vulnerable and create space for the the people with whom we're working to share. We receive, they give, and we in turn create a beautiful video or visual story to give to the community. It's a process and a journey, and it's not always smooth, but it is always worth the humanizing stories and tools that are created and sent into the world at the end. We're inspired by this quote from the articled and how it applies to our storytelling: "Listening has a way of complicating any simplistic good-and-evil dichotomy in this way. When people entrusted me with their stories — their brokenness, their frailties and fallibilities — it made it impossible for me to hate them, even if I was deeply disturbed by some of the things they believed or had done. And when I didn’t hate them, and asked them questions without malice, they could remain open, and it is in this openness that transformation becomes possible." We're so inspired by this individual and we hope to see more stories like this, of people getting out into the world and making connections, bridging gaps, operating with humility, in a cultural space that can sometimes feel reactive or disconnected. We'll leave with this quote from the article: "Listening with judgment, ready to defend and attack, is not the kind of listening I’m talking about. That’s critical thinking, argumentation, debate — important tools that most schools do a good job of teaching. What I’m talking about is listening, a commitment to exploring and building connection with others based on our shared humanity even when that kind of connection seems impossible." We're a small team of people at Chance Multimedia, and it's so important to maintain team members that will uphold the company's ethics and values and understand the often sensitive nature of what we produce. When our dear friend and editor Dan Sohner decided to take his career to the mountains, (where his heart belongs! ), we were on the hunt for a new editor and cinematographer that would jive with our team as well as Dan did. 1. Why did you decide to move to Colorado? I grew up on the east coast, and before moving here I had spent the previous three years in Los Angeles, so I was ready to get away from the endless urban sprawl. I love the outdoors and I’m an avid hiker, so I wanted to move somewhere in the western U.S. with forests, mountains, four seasons, and great weather, and nowhere fits that bill better than Colorado! I only knew a couple of people here but I decided to just take the leap, and I couldn’t be happier with the choice. 2. What was your first shoot experience like with Chance Multimedia? My first shoot with Chance was certainly a memorable one. The day after my interview, I got a call from James asking if I was available the following day for a shoot, which would also serve as a “test run” to see if I was a good fit. Then he asked me if I had ever been up in a helicopter, to which I replied something like, “Uhh… no.” I said I was free and up for the challenge, but couldn’t make any major promises about the quality of my footage. The shoot was a blast, and I managed to walk away with one or two usable shots (with lots of stabilization in post), which I guess was enough to pass the test! 3. What camera gear are you looking at right now? Drone? New DSLR? I’ve been thinking about upgrading my camera body for a year or two now, but just haven’t been quite ready to pull the trigger. I have Canon lenses, so I (like so many others) for years eagerly awaited the release of the Canon 5D mkIV, and I (like so many others) was disappointed when it finally came out. The photo specs are superb, but 60fps at 1080p is underwhelming for slowmo capability, and the 1.74x sensor crop in 4k mode is a deal breaker. I’ll take a bit of pixel binning any day over a crop that extreme. Sony on the other hand has been very impressive over the last several years. The A7S II and A7R II are both fantastic cameras and very tempting, especially with the performance of metabones adapters for using Canon lenses, and the cheaper price tag than the 5D mkIV. The A7S II is certainly the better camera for video with its fantastic low-light capabilities and 120fps slowmo, but the sensor size for photography is a bit underwhelming at 12.2MP, as compared to the A7R II’s 42.4MP sensor. My ideal camera is an all-in-one video and photo camera, which has me leaning towards the A7R II at this point. Sony also just released the A9, which appears to blow both A7’s out of the water. But with a price tag of $4,499.00, I may need a slight raise to make that jump... James? Jessica? 4. What do you do on the weekends? Tell us about your adventures. I try to spend as much of my free time as possible outdoors, preferably hiking. I’m also an avid nature photographer (childhood dream job was to be a National Geographic photographer), so I love finding new remote places to explore with the hopes of spotting any little (or big) critters who might be roaming the woods. I had an awesome adventure just this past Monday in the Mount Evans Wilderness, which is only about an hour from Denver. I hiked the Tanglewood Trail, which follows a beautiful bubbling creek through a lush forest before emerging above the treeline to a saddle beneath Rosalie Peak, a 13’er in the shadow of Mount Evans. I got to break in a new pair of snowshoes for the last couple miles to the top, and the trail was completely lost under fresh snow so there was some bushwhacking involved! The view from the top was incredible and I didn’t see a single other person on the trail all day. I also came across some large and quite ominous animal tracks in the snow, which I later ID’d as belonging to a mountain lion. Or it could’ve been an enormous dog... but I’m going with mountain lion. Makes for a much better story. 5. What are your dreams for the future in the documentary/video production business? I’m passionate about environmental issues and I hope to use the power of documentary filmmaking and visual storytelling to help spread awareness about the impact that climate change is having on all the living creatures of our planet. Facing existential threats are countless species and entire ecosystems, not to mention the homes and way of life of people around the world. I believe climate change is the greatest challenge we’ve ever faced, and I hope to use filmmaking and photography to be part of the fight. Our team was recently at an introductory meeting with a new client, and the topic of sensitivity and participant care-taking came into the conversation as a concern for the client. We're always glad when it does come to the forefront of a client's mind, because that means our priorities are aligned - they're putting the wellbeing of participants and interviewees in front of the story, which is always where we place the most importance. We have strict ethical guidelines in our work not only because of our journalism backgrounds as a team, but because we as individuals uphold strong ethics and values in our own lives, in our own day-to-day interactions with others. We're aware of the power we hold as storytellers with tools, and we ask subjects to make themselves vulnerable through the interview and storytelling process. As such we have a great responsibility to make sure we operate within the comfort of those subjects from beginning to end and beyond. The process involves building relationships, building trust, and intently listening, all keys to crafting beautiful stories and letting people's words be truly felt. We start every interview ensuring the participant that they are fully in control of what goes into the story - they don't have to say or answer anything that makes them feel uncomfortable, and even if they do, they have the right to strike it from the record. We're often in sensitive, nuanced situations where people may be hesitant about our presence, and we're sure to never push any boundaries to "get the shot". We are humbled when we're welcomed into communities, into people's lives, and respecting them is our number one priority. When our ethics and values are aligned with those we're working with and for, the storytelling process is truly powerful and impactful for all those involved. Did you know we moved?? Chance Multimedia has been growing and expanding in great ways. When Chance Multimedia started, James and Jessica were working out of their home in the RiNo neighborhood, before it was hipster Denver, a time that Jessica fondly refers to as RiNo B.C. (RiNo Before Crema). Then when the company grew a little they moved to Green Spaces, a co-working building down the street that offers work stations and a fridge full of beer in a very energy-efficient green conscious building. When the Chances bought their first house in City Park West they renovated the attached garage into a cute, small Ikea-esk office space and moved out of Green Spaces. A couple turnovers, a new baby, and a few years later, we are back in Green Spaces! The community has grown immensely, but it’s still the fun, quirky, relaxed environment that Chance Multimedia thrived in before. With the expansion of Chance’s nonprofit arm, Stories Without Borders, and the addition of a team member, Alex Sandberg, and the expansion of the Chance’s family with little baby Daniel, we just needed some room to spread out. We also wanted to welcome clients, partners and friends into a space where we could offer coffee, beer, couches, and a creative ambiance. Our office is decked out with plants, accented by beautiful brick walls, and we feel great working in a space that is so energy conservative. We were able to become a Certified Green Business through the City of Denver just by being in this space and operating how we do as a company. One of the best parts about this space is being able to mingle with other creative minds every day, as the whole building is full of entrepreneurs of all sorts. Need a web designer? He’s next door! Need someone to help on a shoot? There’s a videographer available! The community is amazing, and the craft beer in the fridge doesn’t hurt. 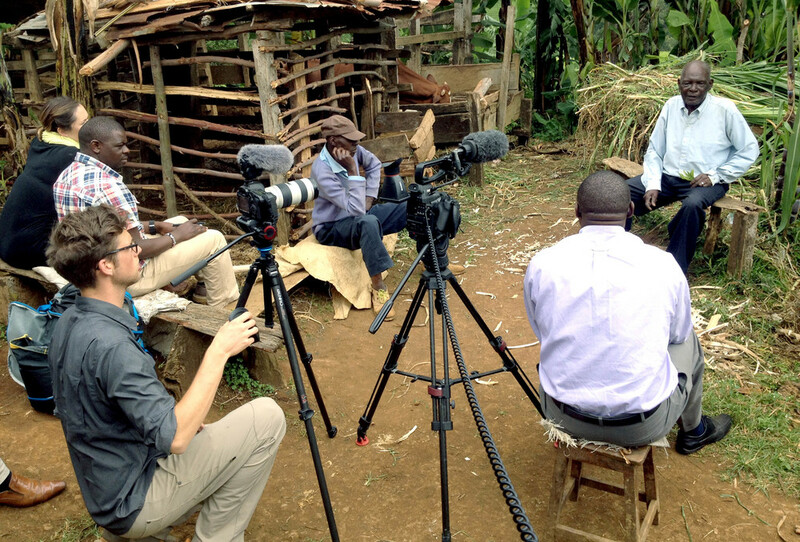 A huge part of our job as videographers and journalists is to listen and absorb. We do a lot of community work for foundations and nonprofits who activate rural city participation through grant opportunities. The documentation of those community-led processes sends us all over Colorado, to Olathe, Fort Morgan, Manzanola… places we hadn’t even registered on the map. Those places have taught us incredible lessons about life in rural cities, reflecting all the rural communities that make up the majority of this country. In these tense political times it’s easy to become polarized. The hard thing is cross those lines and listen to the other side. Rural Colorado has a unique voice, a unique perspective, it’s a dichotomy of new and old, immigrants and generations-old families. When you sit and listen, you have the opportunity to embrace. We’ve heard stories of Somali refugees making the journey to Fort Morgan to work and build better lives, we’ve heard stories of families traveling from Mexico to find peace and security in the small farm town of Olathe, we’ve heard stories of three-generations of families living in San Luis Valley embracing the changes they’ve experienced in their own, small culture. The most important thing is, these people are all now listening to each other through grassroots efforts. Listening creates empathy, empathy creates movement, movement creates great change, and we’re honored to be able to witness these transformations and capture them in visually beautiful ways. Our team kicked off 2016 with a retreat to examine and identify what we value and how, as always, how we can get better at what we do. Questions of Copyright and Value: Where Does Inspiration Come From? Have you ever had an idea stolen? Copied maybe? It’s not a particularly great feeling. But now imagine that that idea ends up on the cover of, let’s say, National Geographic. 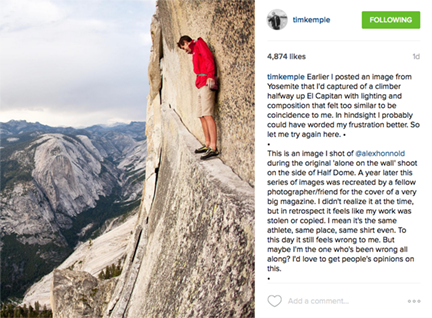 Photographer Tim Kemple has something to say about that. 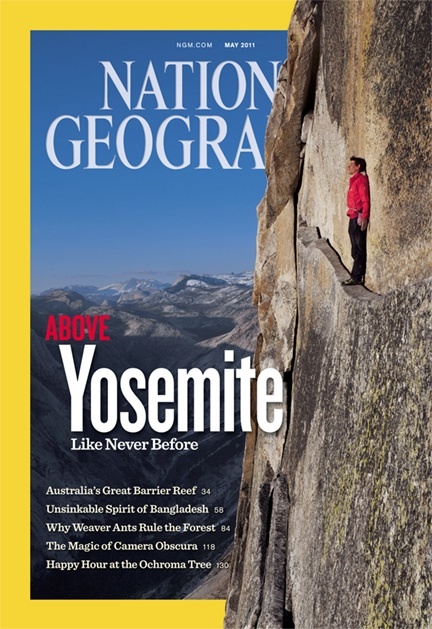 In short, Kemple made an image of an iconic rock climber on an iconic rock climb and another photographer, Jimmy Chin, made a nearly identical image, which he sold to National Geographic. You can imagine the conversation that happened. Mr. Kemple wasn’t very happy and Mr. Chin didn’t seem to see anything wrong. Where does copyright begin and end? What is intellectual property, really? Is this ethical? Where does inspiration truly come from? As a creative person, I think it is sometimes hard to ask yourself where an idea came from or why you decided to create something in a certain way. When you start asking those questions, you start to discover your personal style, which then inevitably relates directly back to everything in this world which inspires you and has most likely inspired someone else at some point. One of the hardest things we have to face as creatives is constantly figuring out how to stay relevant, fresh and innovative. It can be difficult to maintain uniqueness when there is such a saturation of content these days. But is the issue really about the physical production of a similar image, or is it more about the idea of something you made and believe is truly unique being recreated? Does this lessen the value of the unique way you see the world? It is up to us as creatives to draw our own boundaries and direct the evolution of photography and video production in the manor we see fit because the conversations that arise are serving to shape our social values as a whole. When producing content for clients, we have to make sure we can evolve the conversation while still maintaing the point and integrity of the story. As storytellers we give voice to those who may not have had the opportunity to share, and their voice is what inspires us to continue developing content. Even if the story we're telling has already been told, maybe it hasn't been told in this particular way by this particular person, and that interviewee getting their voice and message heard is what matters. I think the point of visual storytelling, whether it's through photography or videography, is to present a platform that helps us all evolve the way we understand the world around us. We have to build off of things people can relate to and in doing that, have to accept the fact that some inspiration is borrowed. We have to tap into the collective conscience in order to build off of what has previously been done. Chloe: Dan, how long have you been an editor? (Of photography and video) Dan: Ever since I started shooting, I have been editing. A lot of people try to be the “do it all” kind of person. Doing that teaches you a lot about efficiency, but is very difficult to do properly. Chloe: What do you enjoy about editing? Dan: I like seeing a project come full circle. I also like interpreting all of the content from the producer and shooter. I have to take the way these two people see the story and make it fit together. Chloe: What do you do to set up an edit? What is your routine? Dan: Everything begins with a meticulous file naming system and I start with the end in mind. I want all of the footage to be easily accessible and searchable by subject and date. I will set up the projects with a folder for Footage, Graphics, Music and the Premiere Project File. Knowing that this same folder setup will be imported into Premiere, making sure everything within “Footage” is labeled properly is important. Inside Premiere, I will set up folders for Footage, Graphics, Music and Sequences. I make sure all of the Sequences are labeled with their contents, the version number and the date, just in case someone else in the office needs to find a specific edit or scene. This also makes naming our exports a lot easier. Chloe: Do you think about edits you want to make during shooting? How much of the editing process is happening during actual production? Dan: Absolutely. We have to be very strategic and efficient with our time at every step in the process. We do this so that we aren’t creating extra work for ourselves and so that we can deliver projects to the client in a timely manner. We will show up to a shoot with a rough outline of how we see the edit going, but are careful to leave room for the unexpected. We are always keeping a running list of the shots we have and constantly communicate the shots we are getting to each other to prevent shooting duplicate footage. Chloe: What are the greatest challenges you have when editing? Dan: I think the hardest part of editing is being concise with the edit. We often come away with a lot of great content and it’s hard to find a place for all of it. This means that I have to only select the very best content for the final edit. by Chloe Wittry, Project Manager What Professor john a. powell has done to advance the discussion and action taken around social equity is astounding. His talk was engaging and extremely relevant as we’re facing some of our most pivotal racism, poverty and inequality issues today. The crowd of attendees were members of organizations and foundations that that are trying to make a difference in the social and economic systems of Coloradans. John a. powell developed an “opportunity-based” model that connects affordable housing to racialized spaces in education, health, health care and employment and is the author of Racing to Justice: Transforming our Concepts of Self and Other to Build an Inclusive Society. He’s written many articles for large publications like Huffington Post and appeared on various tv series and podcast publications. One of his main focuses: Social belonging and how it relates to poverty and inequity. During his discussion he weaved in the cold-hard statistics of current poverty rates with the psychological research behind what is keeping many groups of people in poverty. But it goes way beyond either of these things, to an unconscious level. The fact is there is a huge misunderstanding of what poverty even means and what it’s defined by. One of the main concepts that hit me through powell’s discussion is that poverty extends beyond material inequality and is defined more by a sense of social exclusion and lack of belonging. There are many categories of social exclusion that create a group’s poverty including religion, gender, race and religion. Nearing the end of the seminar, I began to feel a sense of hopelessness, that the solution to the issues being outlined would never be reached, or that there was nothing I could possibly do to make an impact. However powell’s view is that even simply discussing and making ourselves aware of the infinite layers of poverty and all types of social inequality is a movement toward a better world. These issues will always be evolving and the way we look at them will always be changing, so there is no place in which we can say “We’ve arrived.” Building understanding and engaging in discussion can create structural change to meet a multitude of needs and create a more inclusive society. Powell calls for a solution unlike any tactical policy that has previously been attempted, requiring us to communicate with the unconsciousness that derives social exclusion. After seeing powell speak, I will absolutely seek him out again when he comes back to Colorado. As our main interests lie in telling stories around social justice at Chance Multimedia, it's important that we keep abreast of these issues and ideas as they develop and are in constant flux. The Colorado Trust puts on many wonderful programs through their Health Equity Learning Series. Keep an eye on their page for upcoming events or sign up for their newsletter. By Jessica Chance Chance Multimedia is growing. Stories Without Borders, our nonprofit organization, is gaining steam and producing great projects. And any day now, I’m going to have a baby. What does this mean for our company, our clients and partners and the future? We’ve been answering a lot of good questions lately. Here are answers to a few. If you have more, please contact us at our team e-mail connect@chancemultimedia.com! Congratulations on the baby! What does this mean for my project?! This year we’ve truly become a full service, full time company, beyond James and myself, so we don’t actually anticipate any functional downtime at all once the baby arrives. This is entirely due to the addition of our awesome team members, Chloe Wittry and Dan Sohner, who have been preparing with us for this time all year long. Yes, I will be stepping away from daily desk work starting September 1st, and be effectively on maternity leave from Chance Multimedia through December 15th. In my place, Chloe, our Project Manager, will be running CM full time. Chloe has been with us since the beginning of 2015, and she’s been shadowing me in anticipation of taking over this role for six months. She’s talented, creative and thoughtful, and we’re enthusiastic about the new ideas, energy and leadership she is bringing to our clients and projects! Chloe will continue to serve as project manager. Upon my return, I will be able to refine my focus as a producer and director. Frankly, we were overdue for this expansion, and my maternity leave is the perfect time to bring in additional leadership. Will James take time off? What if I need a photo or need to start a project? James will take a few weeks of paternity leave once the baby is born. Luckily, since our office is so close to home, he will be able to return to work and be available for shoots on a regular basis in October, while still getting to spend time with his newborn son. Additionally, Dan Sohner, our talented cinematographer and editor, will manage any time-sensitive shoots that come in while James is away in September. Once October hits, we’ll be back to business as usual on the shooting side. James will continue to serve as business leader at Chance Multimedia, assisted by Chloe, while I am on maternity leave. What’s happening with the nonprofit? Stories Without Borders has really taken off in 2015. We’re currently producing our second independent documentary, working with several strategic partners on projects, and have provided quite a few storytelling trainings from Denver to Senegal this year. When I return to work in 2015, I will continue to work with our talented Board of Directors to lead the organization as we continue to fulfill our mission, to work independently and in partnership with organizations to tell underreported stories and empower new storytellers. Our doors our open and we're ready to roll! The new members of our team are allowing Chance to continue business as usual and we're thrilled to hear about new ideas and projects. Making room for a baby has forced us to look at the way we currently do things and envision how we can do them better. We’ve been working hard all year to prepare for this time and these transitions. When you contact us now or into the future you’re connecting with the same team you’ve come to know and trust, plus new equipment, more specialized talent, better support and an energized outlook. We look forward to working with all of our current clients, and some new ones too, as Chance Multimedia and Stories Without Borders moves into a new era! Hi all, Things have been a little quiet lately on the blog because of a new project we’re working on, but we’re back online! 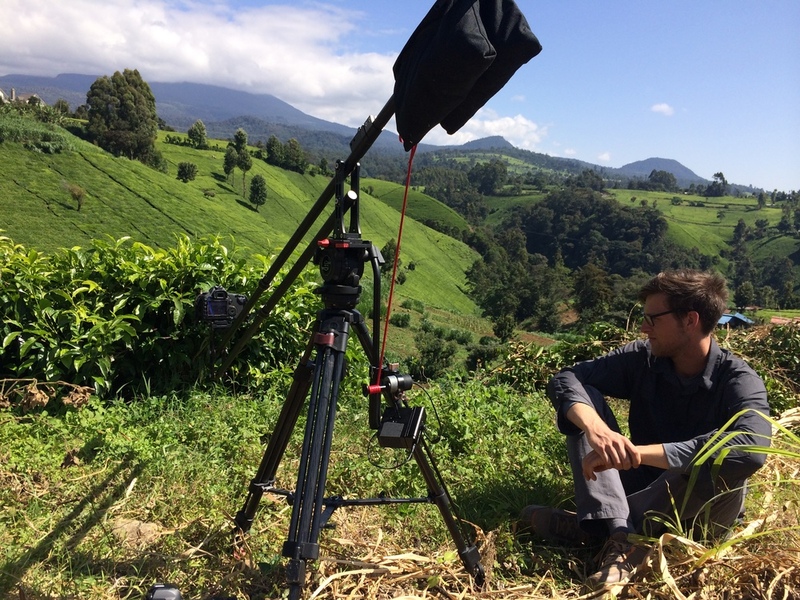 We’ve been developing a new documentary with with a unique window into tea production practices in Kenya, the world export leader of black tea. We spent the last couple of weeks in production in Kenya, meeting new people and discovering new stories on small tea farms. We are learning about the tea trade and synthesizing that information for a new media and storytelling platform. It’s exciting stuff! Not only are we capturing a unique story that has yet to be told in this light, but the way it’s going to be shared with viewers will be completely new. We can’t wait to share these new stories with you! Until then, here are some pictures from the recent trip. Greetings! 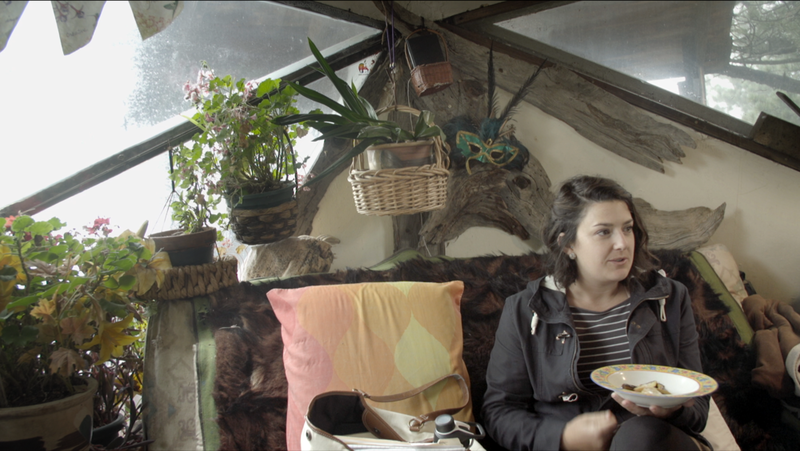 Our documentary Living With the Dead has been chosen to screen at the Intendence Film Festival the last week of June. We are excited and honored! Living with the Dead is one of 13 films to be chosen from Colorado and 26 chosen from other states and countries. IFF's mission is to provide an inclusive film event that features the world-class talents of the Colorado film industry, while acknowledging good filmmaking wherever it originates. The festival also encourages and recognizes emerging young filmmakers. We are so happy to get Living With the Dead back out there for another screening. Living With the Dead was our first feature-length documentary film researched and shot over a period of five years in Manila, Philippines. Manila is the most densely populated city in the world with an average of 43,000 people living per square kilometer. In the center of this heaving metropolis lies the North Cemetery which is home to a living community of more than 2,000 people. In a country where around 40 percent of people live below the poverty line, and population in Manila is reaching desperate proportions, the cemetery provides a unique residence for the hundreds of families that live and work within its walls. Our documentary explores the lives and dreams of several cemetery residents as well as the socioeconomic and political issues that brought them there. We can’t wait to see what other incredible documentaries have been chosen to screen at the festival. There are so many stories that need to be told! The Intendence Film Festival (IFF) will be screening films from Colorado and the rest of the world on Thursday, June 25, through Saturday, June 27, 2015, at the Open Media Foundation. Check out more information about the fest and film lineup at their Facebook page. Documentary: Living with the Dead (trailer) from Chance Multimedia on Vimeo. The Movi excels at following people and things - a child’s feet running with a soccer ball, a bike’s wheels trailing along a dirt path, or a presenter anxiously walking onto a stage to face the crowd. We use the Movi to capture close-up, intimate movements steadily, providing a visceral experience for the viewer. MOVI from Chance Multimedia on Vimeo. The slider likes to pan the scene. We use it to provide the viewer with a natural path on which to follow the story. Slider from Chance Multimedia on Vimeo. The jib comes in to grab the entire scene. We use it to create a certain feeling of wonderment in the viewer, an awe that comes with the weightless aerial view of a situation that the jib instantly yields. Jib from Chance Multimedia on Vimeo. These are just a few of the tools we utilize in video production to capture scenes in the most unique and visual way. In the hands of talented cinematographers, under the eye of a keen director and woven together through the editing process, they allow us to capture a very intimate and dynamic experience for the viewer. You can see the results of these tools in our work. Don't forget, we rent our gear out! Check out the Equipment Rentals page for more information. Greetings! Yesterday we had a group of bright, young aspiring journalists, storytellers and filmmakers into our offices to give them a tour of the facilities and teach them the ways of a small documentary production company. They had been traveling to news stations and large networks, so Chance Multimedia was quite a different animal for them to see. We hope we were as inspiring to them as they were to us. It's an interesting thing to build a company from the ground up, then finally get to a place where others who are aspiring to be professionals are actually consulting you for advice. In what sometimes feels like a chaotic juggle of projects, timelines and budgets, it's nice to be able to simply and confidently answer the questions of curious, young people. We like being mentors, and we love seeing uninhibited passion. That passion is what drives great work. So thank you, Colorado Academy students. You are welcome back anytime!